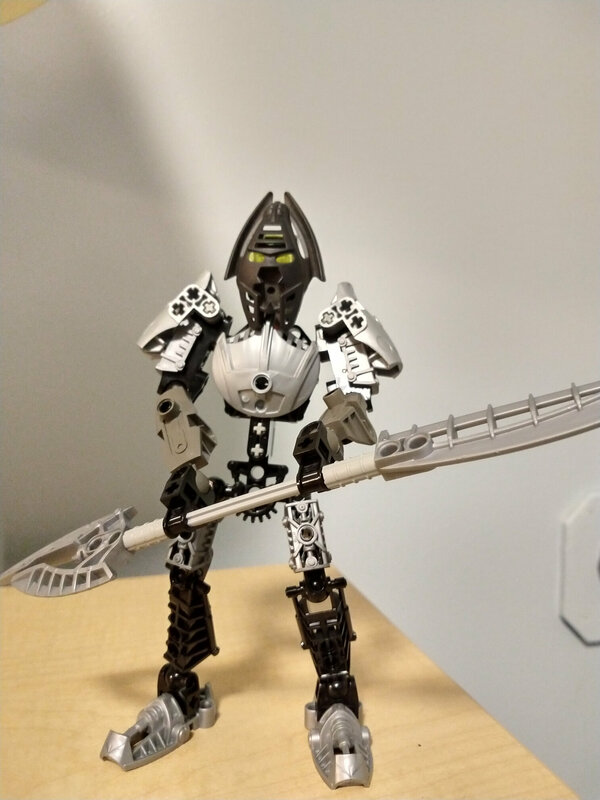 Searching through the Mask of Dimensional Gates, one can find near infinite new Toa, each brought about by minut differences between realities. 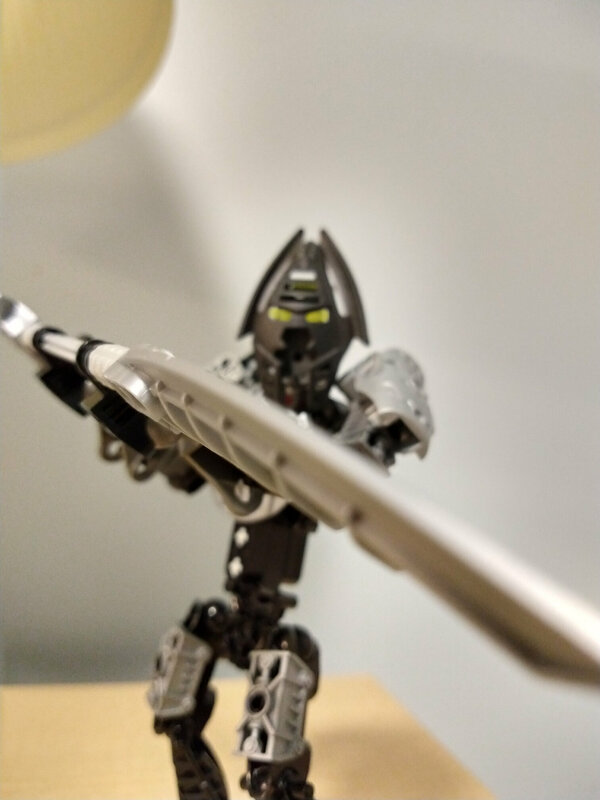 In one such reality, when takanuva descended into Makuta's lair, a matoran by the name of Temoro ended up, in the last moments of the fight, tackling makuta throwing him off balance enough for takanuva to hit him with a blast of light energy, knocking off his Kraahkan and propelling both makuta and Temoro into a pool of energized protodermis. 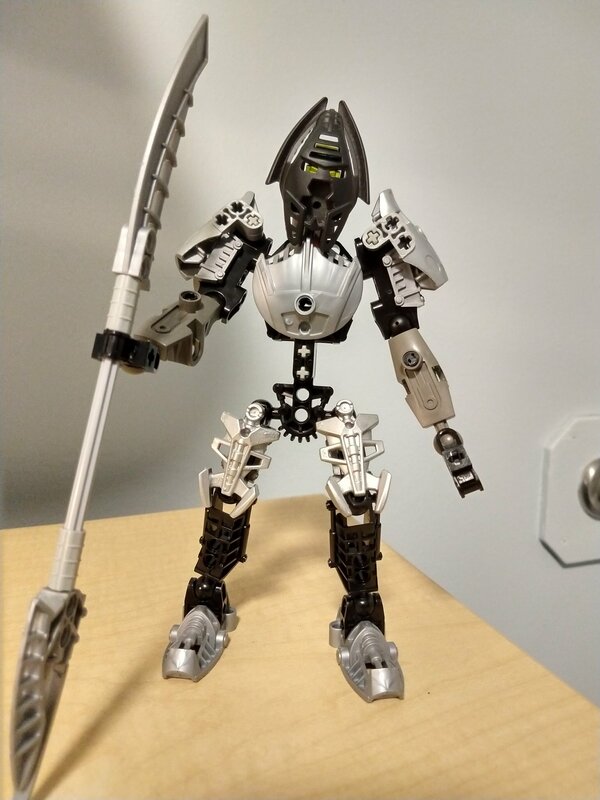 The Kraahkan, now separated from makuta, was fused with Temoro within the pool of prorodermis, allowing him to not only survive, but imbuing him with toa-like powers, of shadow! 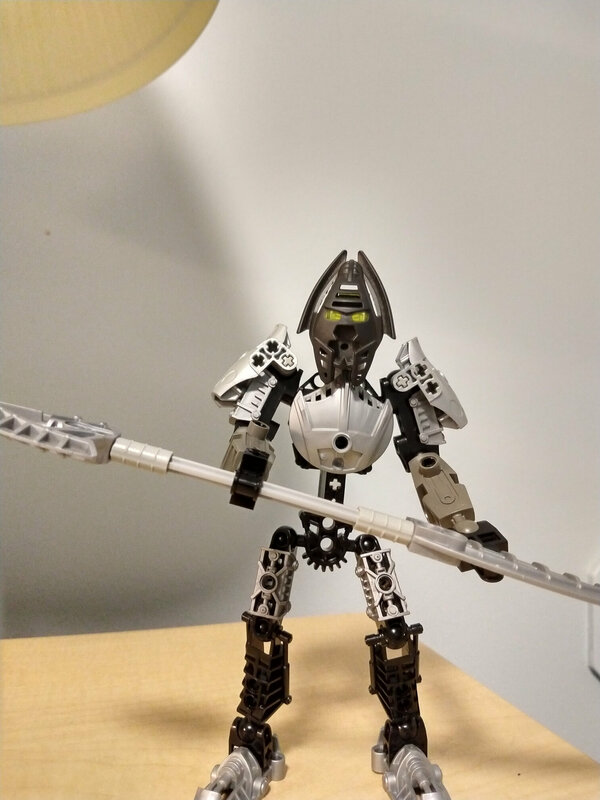 When he emerged from the pool, wearing the "transformed" Kraahkan he dubbed himself Toa Temonuva and assisted takanuva in holding open the gate, and they both left with the rest of the matoran. This guy was a lot of fun to plan out and make. Although technically he isn't even done yet. 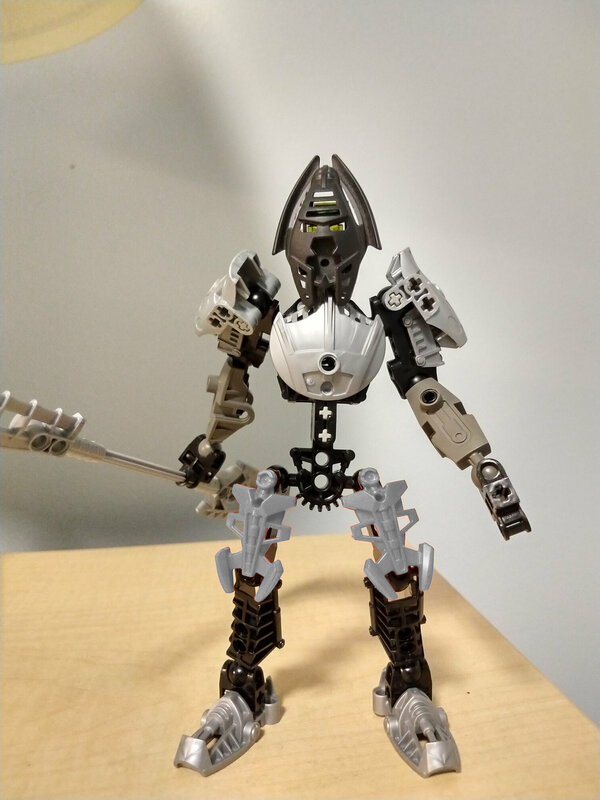 I'm still waiting on one last Bricklink order with some armor pieces for the waist, and I have plans to use some pieces of the red Tahu stars armor (repainted silver to match the rest of the armor) as the upper leg armor pieces, but Amazon's one day shipping seems to mean a day after order it gets shipped and is then scheduled to arrive a week later, and I just couldn't wait to share this. So you're just going to have to put up with the regular red pieces baddly Photoshopped Gray. What do you guys think? I think the unique way you've attached Kalmah armour onto the shoulders is great - works really well. Though, I'm not totally sure about the Stars armour on the thighs - I feel like the metru armour just fits a little better - however part of that might be that it's been photoshopped and isn't actually painted, making it look a bit out of place. Also probably because I'm so used to seeing metru armour used on that leg design. Though overall it's looking really good! I actually got the paint for those two pieces earlier today. Here it is! I think it looks pretty good, but I would still like some other opinions! Edit: sorry about the double post. My internet's being weird. @The_Eagle_Kid Ah, that works a lot better now, it was just the photoshop making it look a little off. I'll definitely have to try that. Thanks! And hopefully my Bricklink order will get here soon so I can finish the waist armor. 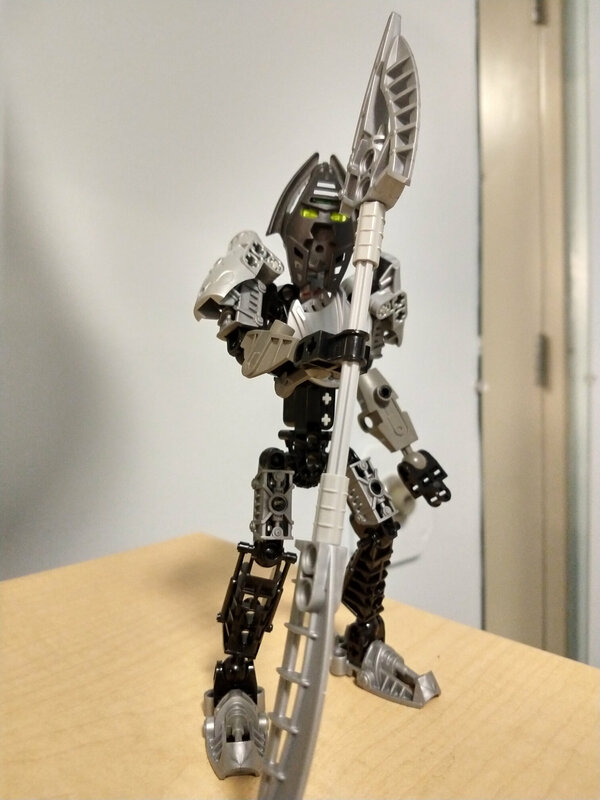 Edit: Just checked on the order, I was wrong, it isn't armor for the waist, it's actually the skall armor for the metru legs. So now I need to find waist armor. Neat MOC! I like how you did the arms. Maybe you could add something to the waist as it's pretty thin. Thanks! And do you have any suggestions for armor (or something like that) for the waist? I've been thinking but can't really find anything I'm happy with. Ok, wow. I feel like an idiot for not thinking of his shoulder design. Thanks! I'll probably be updating this soon.